At least two trees down completely block Route 82 in East Marlborough. Trees and branches are down across the county, closing roads and making travel hazardous. 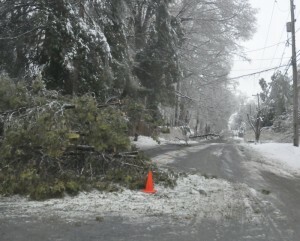 An icy coating on trees and roadways has wreaked havoc with travel and power lines throughout Chester County, cutting off power to more than 180,000 county residents, and creating potentially hazardous conditions with ice-coated falling trees and tree limbs. The commissioners closed all government facilities for Wednesday, Feb. 5, and alerts from area municipalities have urged residents to stay put. Most school districts switched from two-hour delays to closures. Five warming shelters have been established: Avon Grove High School, 257 State Road, West Grove, PA; Lionville Middle School, 550 W. Uwchlan Avenue, Exton, PA; Barkley Elementary School,320 Second Avenue, Phoenixville, PA; Sykes Student Union, 110 West Rosedale Avenue, West Chester, PA; at 3PM – Pope John Paul, 2875 Manor Road, Coatesville, PA. If you need transportation please call 610-344-5195. While the roadways in much of the county were clear of the ice, it was trees and downed wires that provided the greatest hazards. Travel around the county is, at best, slow as multiple road have been closed. Road crews and PECO are working to clear wires and downed trees, but because of the magnitude of the storm, it could take some time, official said. 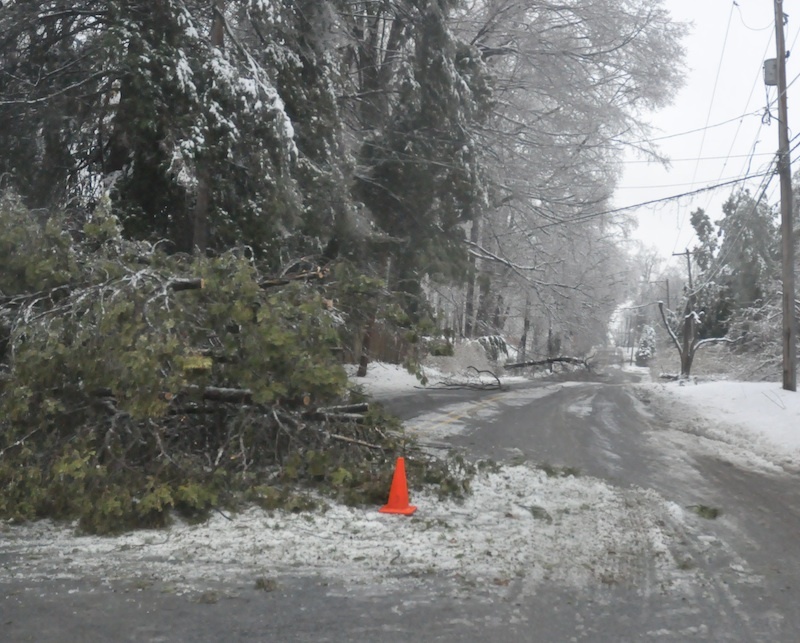 Although temperatures have climbed above freezing, downed trees have resulted in numerous road closures throughout the region. So even though roads are no longer slippery, they may be subject to blockades. In addition, many traffic lights are inoperable. PECO is reporting hundreds of thousands of power outages with a high concentration in Chester County – and no estimated time of repairs in many instances. Officials from the Chester County Department of Emergency Services reported at noon that 185,000 county residents remained without power. One last worry: the rain and melting snow could cause river flooding, potentially closing more roads.